Show me a person who loves to iron and I will show you an aberration. For nobody really enjoys the mundane chore that is ironing. I certainly do not. Ask M. He will tell you about how I have given up ironing his clothes ever since J came along. I can just about manage J’s and mine. On a good day, that is. I’ll be honest. I have done the unmentionable and ironed only the collars and cuffs through the long, cold winters. With a jumper pulled over, how could it matter? 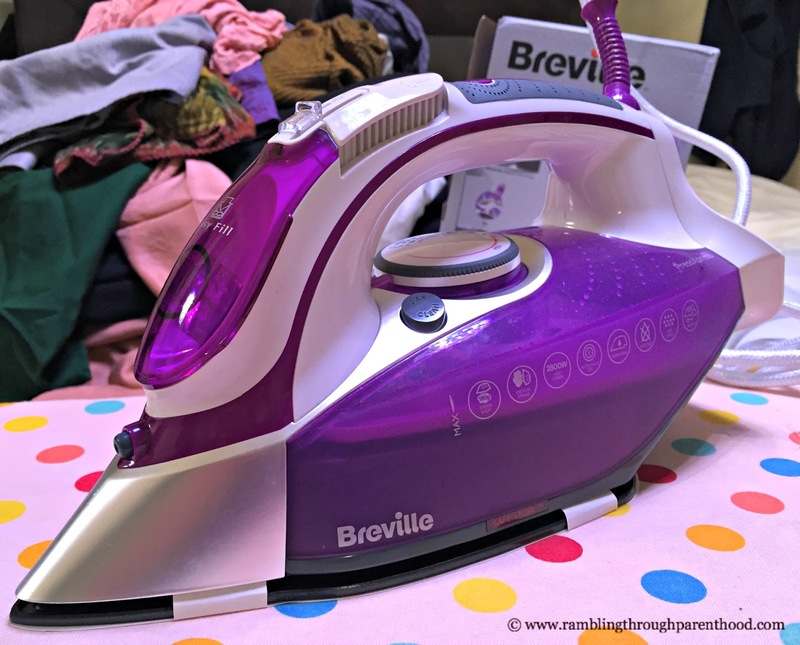 There comes a time in everyone’s life when you need something more than cold winters to help you plod through the ever-growing pile of ironing. 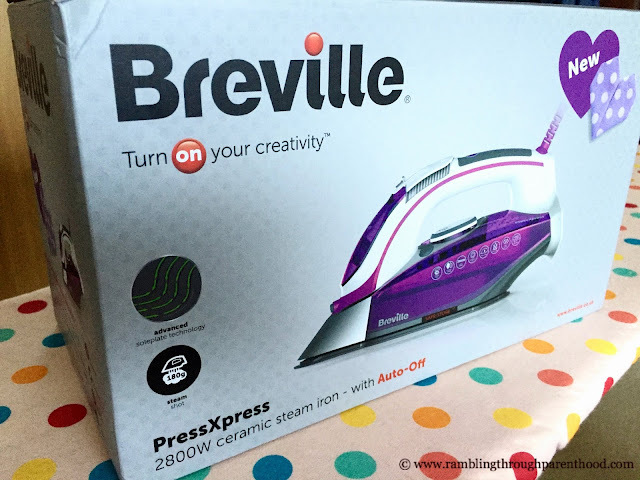 The new PressXpress ceramic steam iron by Breville promised to do that. I was sceptical. 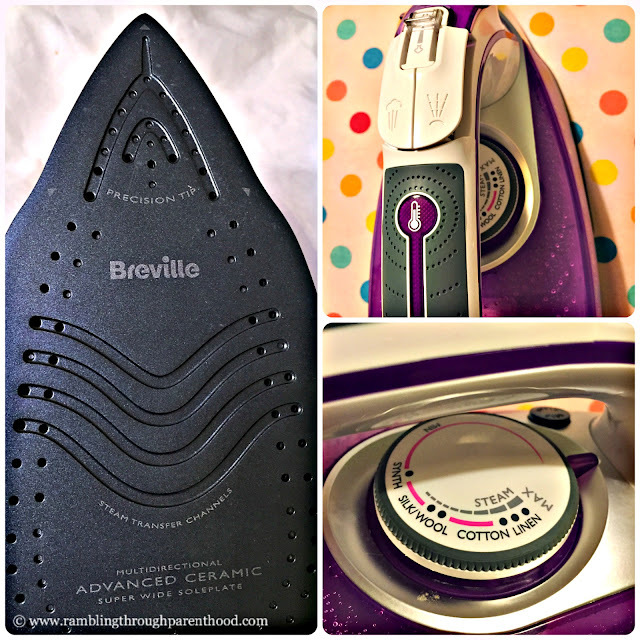 How can one iron be any better than the next? I’m the first to admit when I am wrong. I was. For a start, the PressXpress looked more stylish than any iron I have ever used. Shiny purple, just my thing. Next, it came with a huge 400mls capacity water tank with a wide mouth that meant there were no spillages and fewer refills. The grip was comfortable and the iron was a great weight, both of which meant it was easier to glide on fabric. When they say easy-glide, they mean easy-glide with this one. Check out my video log to find out how I got on using the PressXpress and whether it lived up to claims of making ironing a breeze. As you can see, the powerful steam shots and the wide ceramic soleplate with the precision tip really made light work of those stubborn creases. The safety features on this nifty little thing from Breville are impressive too. Most important is the auto shut-off which automatically switches the iron off if left unattended or knocked over and the Safe-Store indicator strip that tells you when the iron is cool enough to put away. The anti-drip, anti-scale, self-clean features and the extra long 3m power cord are an added bonus to make life more comfortable. Then there is that vertical steam function that I am keen to try out on my curtains. I have a feeling I won’t be disappointed. M thinks I am crackers to be gushing so over an iron. Can't help it. I no longer baulk at the site of that mountain of clothing that needs to be crease-free. I know the PressXpress will see me through. The only thing better will be a wand to magic those creases away. Disclosure: I was sent the steam iron for the purpose of this review. All opinions are my own. I need to get a new iron, but I'm tempted by the idea of an ironing system having had one before. This iron sounds good though. Haha, I am an aberration! I genuinely love ironing! I find it so therapeutic and relaxing. Honestly! My husband just can't understand why I enjoy it so much. This one looks fab, I love the purple colour! I certainly do not like ironing lol although I don't mind washing up. But ironing goes on forever. Basically if it can get away with not being ironed then I will not iron it! I am strictly a weddings and funerals sort of an ironer!! I have refined my clothes drying techniques to be able to avoid ironing where possible! However this one does sound like it makes a dull job easier!